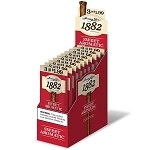 Celebrating their founding over 130 years ago, the famous Garcia y Vega Company has added another line to their historic portfolio. 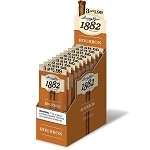 The Garcia y Vega 1882 Cigars is a roughly hewn, cheroot style stogy that utilizes all natural filler rolled inside an aged broadleaf wrapper. 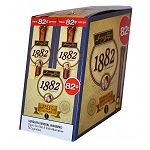 Following on the heels of the highly regarded Game Leaf line, the 1882 is also available in four fabulous flavors, including Sweet Aromatic, Honey Berry, White Grape, and Bourbon. An affordable alternative to the more costly all natural infused cigars, you can expect a smooth clean draw, outstanding taste, and lush aromas. As an added bonus, these little babies feature a re-sealable pouch to ensure each cigar is factory fresh and ready to smoke.